We’re back! After four and a half days in a rental car, my wife and I have arrived in San Francisco. We’re currently staying at an apartment in the Mission, temporary digs while we look for longer-term housing in the overpriced Bay Area housing market. Instead of taking the quick way down from Seattle (14 or so hours of straight driving), we took a more leisurely trip and saw some family and friends. First, we stopped in Portland, Oregon, the green and river-watered setting of “Portlandia,” where we stayed with my cousin who I haven’t seen since we were both teenagers making silly home movies on VHS. The next night we stayed in Eugene, just a few hours to the south, where we stayed with my cousin’s parents (my uncle and aunt) and saw old family photos. We spent the next day on the slopes of Crater Lake, which I’d never seen before, a giant volcanic caldera less than 10,000 years old, which reminded me of Santorini which we saw earlier in the year on our trip to Greece. Then we drove through the dry mountains to Reno, Nevada, where we stayed at Reno-Sparks Indian Colony with the priest who married us back in 2010. The last leg of our journey saw us over the Sierras, past Clark Ashton Smith’s birthplace in Auburn, California, around the northern edges of San Francisco Bay and finally… SAN FRANCISCO!!! And here we are now, though I haven’t even unpacked my desktop computer and I need to do laundry. Also, our dog, June, is insanely agitated by all the city pigeons; I’m suspecting that a thin high-pitched whining was her word for “squirrels” but her word for “pigeons” is a full-throated, hollering scream. There’s lots of work to do, but for now we’re chilling in a cafe and I’m enjoying my first Espresso Service since the end of our journey. In the meantime, allow me to present Chapter 5 of The Stiff! If you’ve been following along, I hope you like it; if you’ve just stumbled on this page, go back to Chapter 1 and read from the beginning. I’ll be updating twice a week, with breaks for more zombie-themed art, for the next few months. Thanks for reading, and I’ll post the first actual comic page of Chapter 5 next week! Thanx! Will do. Nice Asian-Indian idol. An area Lovecraft really didn’t explore. 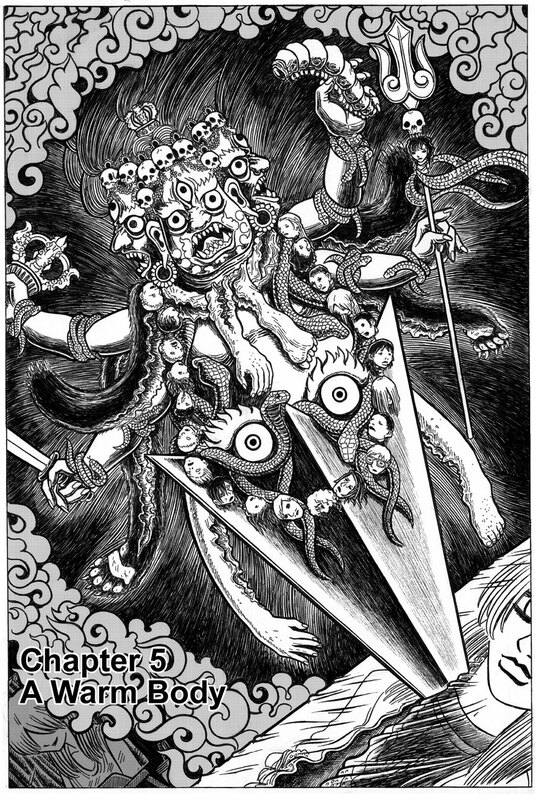 I think Lovecraft once wrote in his Commonplace Book that he wanted to write something about the Tibetan ‘reincarnation ritual’ where a sorcerer ties up a corpse, resurrects it, and then wrestles around with it and bites its tongue off (thereby, of course, gaining magic powers). In one of Clark Ashton Smith’s short stories it was mentioned that just eating a bit of a sorcerer would give the eater all of that sorcerer’s powers. Malkris was the name of him who was feared. From Lovecraft‘s Common Place Book. 192 Thibetan ROLANG—Sorcerer (or NGAGSPA) reanimates a corpse by holding it in a dark room—lying on it mouth to mouth and repeating a magic formula with all else banished from his mind. Corpse slowly comes to life and stands up. Tries to escape—leaps, bounds, and struggles—but sorcerer holds it. Continues with magic formula. Corpse sticks out tongue and sorcerer bites it off. Corpse then collapses. Tongue become a valuable magic talisman. If corpse escapes—hideous results and death to sorcerer.